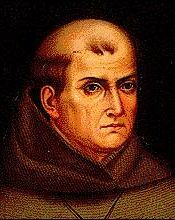 Pope Francis announced a few days ago that Junipero Serra–the Catholic priest who in 1769 helped lead the Spanish takeover of California, changing everything–will be declared a saint. The pope’s decision already is controversial, given that Serra’s journey eventually led directly to the poor treatment and eventual extermination of nearly all local Indians. His critics long have called him the Christopher Columbus of California. Without mentioning the name of Serra, I deal with some of the baggage he left behind in my debut novel, OFFSIDE: A Mystery. The book focuses on the fictional murder of an adult referee of youth soccer around Los Angeles in 2006 amid an all-too-real real estate bubble and racial-tension cauldron. My book is fiction, but includes a fair amount of real history (for which footnotes can be found elsewhere on this site). Some of this concerns the move of Serra, a Franciscan priest, from Mexico into California and what happened after he died in 1784 amid the development of the famous string of Catholic redoubts along the coast called missions. In my view, the system that Serra established set the stage for the terrible race relations that afflict California to this day. Here’s a brief excerpt from OFFSIDE. After several centuries of inaction, Spain finally decided to do something decisive about … California. One catalyst was looming threats from Russian and British explorers. Another was the fear of Spain’s paranoid leader King Carlos III that the aggressive Jesuits, who had been in Mexico since 1697 and ran their operation as much like a political machine as a religious organization, might try to unseat him. There were also rumors the Jesuits were really raking it in money-wise. Thus, in 1768 Carlos expelled the Jesuits from all Spanish territory. This was particularly felt in Mexico, where the Jesuits were doing a lot more for the Indians—teaching them such important skills, for example, as shipbuilding—than they were doing for the Spanish. Carlos gave the civilize-the-local-Indians-but-favor-us missionary contract to the Jesuits’ great and more compliant Catholic rival, the Franciscans. So in 1769, a truly epic year in California history, Franciscans guarded by Spanish soldiers—although it seemed at times more like the other way around—marched and sailed north into … California. Besides an assertion of sovereignty, the Spaniards also brought along Spain’s Law of the Indies. No recognition of property rights of Indians in lands they weren’t actually occupying. No payments whatsoever for other land seized. Freedom to loot. Given the large number of Indian villages being passed daily—full of armed but friendly often-naked natives—this was bound to create problems. That 1769 Spanish takeover …changed everything. Although the Indians of California—all 130,000 of them—didn’t realize it, their days became seriously numbered. Within three generations all but a couple thousand were gone—dead, mostly. This was from a combination of things: (1) illnesses brought by the foreigners, (2) oppressive tactics supervised by corrupt Catholic priests running a system they set up of religious outposts like the San Fernando Mission near Los Angeles that also doubled as prison farms—and which later were turned into pleasant tourist attractions that ignored the death stuff, and (3) greedy land practices that featured the murderous use of force as an eviction tool. To my mind, about the best that could be said about the mission system was that it helped preserve a semblance of domestic order, albeit at tremendous cost to human life and dignity. The very location of the missions–spaced a day’s journey apart along the crucial north-south horse trail paralleling the coast that Spain for national security reasons had to keep intact to handle military and commercial traffic–gave the lie to solemn statements that the betterment or even salvation of Indians was the overriding purpose. Increasingly catering to travelers, the missions more resembled upscale, conveniently located hotels–making Serra the Conrad Hilton of his time–staffed by dirt-cheap Indian labor monitored by soldiers who outnumbered the priests by a ratio of about three-to-one. These practices and outcomes in the name of God have not been emphasized at the San Fernando Mission, founded in 1797, 13 years after Serra’s death. When I last visited the mission a few years ago, an officially endorsed “documentary history” of the mission sold in its gift shop did not go into great detail on these points. The book did note that the big dedication ceremony in 1797 included “troops sent to garrison the new establishment,” which might suggest security problems with the native population. However, on my trip, for $4 visitors to the mission could gaze upon the tomb of Bob Hope, the right-wing comedian who appeared on a 1962 Life Magazine cover wearing an Indian headdress but otherwise was not known to be a leading supporter of indigenous culture. Still, Hope was Catholic, famous and extremely rich, and after he died in 2003 at age 100, his heirs paid a bundle to the Catholic Church for the prime burial spot. According to its own website, the San Fernando Mission describes itself as “a mirror into the life of early California during the Provincial era.” For some reason, there is no daily reenactment of the Indian whippings in the aftermath of Serra.